Offering increased reliability for industrial applications, T34 series axial-leaded through-hole devices deliver increased mechanical shock and vibration withstand ability, along with longer life. Optimized for timing, filtering, energy hold-up, and pulse power applications, the capacitors released today offer high vibration (sinusoidal: 80 G; random: 54 G) and mechanical shock (500 G) capabilities, while providing a long life of 1000 hours minimum at +200 °C. 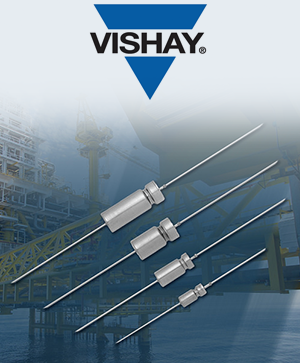 Offered in the A, B, C, and D case codes, the T34 series features voltage ratings from 25 to 125 VDC, a wide capacitance range from 10 to 470 µF — with extensions planned to match current Vishay Sprague 134D series ratings — and capacitance tolerance of ± 10 % and ± 20 % standard. Have we inspired your curiosity? Our sales team looks forward to reading from you! The datasheet as a PDF-file you can find here.